Baker Cowan Songwriting – Songwriters Lisa Marie Baker and Catherine Cowan are sisters. They have written together all their lives, in a variety of genres. Songwriters Lisa Marie Baker and Catherine Cowan are sisters. They have written together all their lives, in a variety of genres. Songwriters Lisa Marie Baker and Catherine Cowan are sisters. They have written together all their lives, in a large variety of genres including commercial ballads, quirky alternative, light jazz , theatrical and comedy. Baker and Cowan recorded their first album ‘Less Than Nothing’ with singer Holly Taymar in 2004. It is a collection of acoustic and swing band songs, written in the style of jazz standards. One of the ballads they wrote for Holly, ‘Getting Ready For No-One’, was featured on York TV and BBC 2 ‘Castle In The Country’ with Nicki Chapman. Their cabaret noir band ‘Vesper Walk’ has a loyal following and was nominated for Outstanding Band of the Year in 2016 and 2017 by Yorkshire Gig Guide. 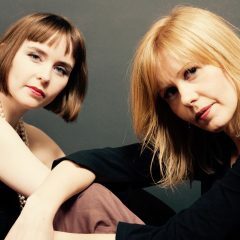 Baker and Cowan co-wrote the Vesper Walk double EP ‘Fallen Angel’ which has been performed at the Edinburgh Festival and the National Centre for Early Music. The songs have been played on BBC Radio York, Vale Radio and BCB Radio. Aside from the albums there have been many other songs written including a collection of songs for children. They are currently recording their new musical ‘Really Really Want’ which previewed at York Theatre Royal in 2016. The songs were described by Unknown Magazine as ‘witty and topical, making an immediate connection with the audience’. Funny and poignant in equal doses, the “Really Really Want” score examines the joys and pains of Girl-Power. It is a celebration of womanhood and midlife. Baker and Cowan have been featured in Birmingham’s ‘Inspire Magazine’, York Press, YO1 Magazine and One & Other Magazine. They are classically trained musicians who play a variety of instruments including flute, cello, violin and piano. Catherine currently teaches at the Leeds College of Music. The sisters are always keen to work with new singers, producers and co-writers.